What makes for a good tent? For me, there are a ton of factors to consider. Weight, durability, space and ease of set-up. Every time I look into tents I am amazed at the range of designs and prices. There are so many things to consider when picking a tent. Versatility is key. Functionality is not optional. 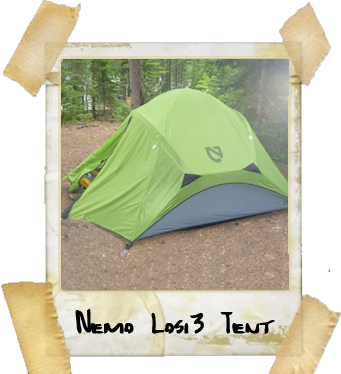 Nemo makes one of the most well thought out tent packages I have ever seen. If are looking for an Uber-light minimalist shelter, this is not it. It is a bomber 3 person cocoon from the elements. The pole design takes the classic 2 pole dome tent and adds a pair of poles that make the tent feel 30% larger on the inside. The added poles make the walls nearly vertical and add to the structural strength as well. 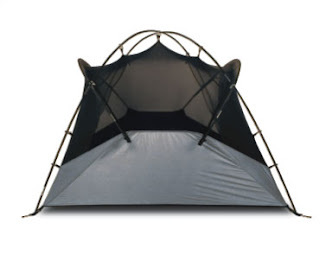 The tent without the fly is noticeably more stable than a comparable two pole only tent. The entire top half is no-see-em bug screen that is suspended by clips to the poles. The lower half creates a deep nylon tub that will keep any precip that may sneak past the fly completely at bay. If you're not worries about getting wet, sleeping in this tent without the fly lets you forget you're in a tent. The bug screen seems to disappear against the night's sky. Put the fly on and you are ready to battle anything the skies can throw at you. A deluge of rain or howling winds are no match for this bunker. Take the 50 sq ft of interior space and add on another 24 in vestibule area, one on each side. Simple stake out the four corners of the tent and add 4 more to tie off the fly and this set-up is solid as a rock. The fly zips open wide so you can roll back sections for great visibility and air flow. With the top half of the tent being screen, the chance of humidity building up inside is almost zero. I spent the night, with two kids, in this tent. 88 degrees during the day, and mid 70's at night, early morning rain and flat out sticky. Usually those are the ingredients for a sticky wet mess inside any tent. Yet, we were incredibly dry and comfortable inside. Setting this up is a snap. The two main poles are joined in the middle by a swiveling hub that adds to the stability of the set-up and makes one person assembly easy. The clips that secure the tent to the structure are solid and can be done one-handed , in the dark. As I said before, every detail of this tent is obviously well thought out. I love the package this tent is stored in. It has individual compartments for the Tent, Fly, Poles and Stakes so each stay organized and the likelihood that you get an accidental tear or puncture is basically zero. Once stored, the whole deal rolls up like a sleeping pad and has two cinch straps to secure everything in place. At $399 this tent is one of the more expensive 3-person shelters we have tested, but this is an example of "you get what you pay for". I would suggest you add the footprint ($49.95). If you feel like spoiling yourself add the Pawprint, an interior floor liner that is made of soft brushed fabric($54.95).